Suffering from heatstroke, Jonny Brownlee came in second at the World Triathlon Series after Alistair all but threw him over the line. Congratulations to Bramhope Olympian Alistair Brownlee. The 24-year-old triathlete who scooped a gold medal at last summer's games is heading to London today. He will get an MBE for his sporting success from the Queen. British Olympic champions walk the gold carpet at the Olympic Ball. 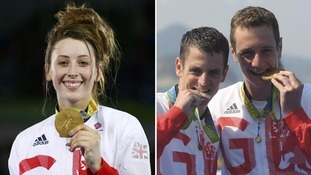 Yorkshire has been celebrating its success after athletes win ten medals for Team GB. Alistair Brownlee has revealed a diet of Yorkshire puddings and pies helped him become the men's Olympic triathlon champion.